I had the interesting experience this week of someone copying one of my videos this week and uploading it to their account with links to their website. Now I guess I should feel flattered by this that someone simply copied my video to try and get a few clicks to their website but still its something that when you notice it you should take swift action. Well Im pleased to say that the process of doing this on YouTube was actually very quick and pain free. Now when you click the button you will be presented with the following options. Now in my case I had someone who had copied my work so I chose the “Infringes my rights” button and then chose the “Infringes my copyright” option. 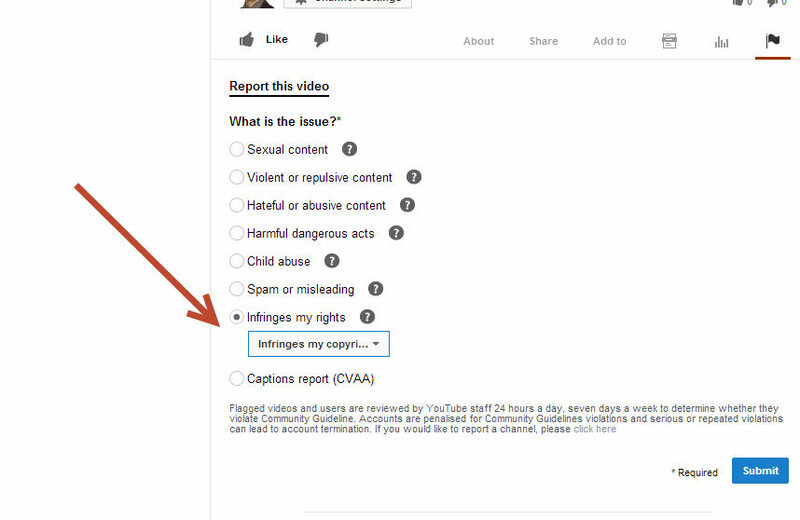 But as you can see there are a number of options you can choose from depending on the nature of the video. Well after I had submitted this case and my personal contact details I received a reply from YouTube within 24 hours they had removed the infringing video. So all in all it was a very pleasant experience for me to deal with YouTube on this matter. So if you ever find your work being copied just follow this process and you will be just fine!